Ulster University Business School students on the BSc Finance & Investment Management and MSc Global Investment Management had their achievements recognised at the CISI (NI) annual dinner held in St. Anne’s Cathedral. Employers including Cunningham Coates Stockbrokers, Investec Wealth & Investment, Quilter Cheviot, Tilney, Brewin Dolphin and Davy along with The Chartered Institute for Securities and Investment (CISI) helped develop the coursework, facilitated student mentoring by their staff members and sponsored a prize for the best performing trading team. The winners of the CISI NI Investment Student of the Year award were Ronan Harris, Chris Cunningham, Roisin Duggan & Graham Brady. 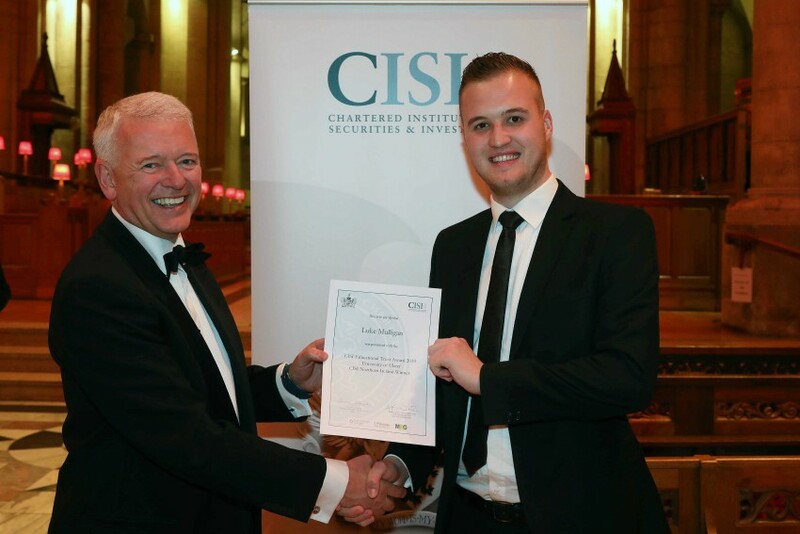 Top performing undergraduate student Luke Mulligan also received a CISI sponsored educational trust award at the gala dinner in recognition of his achievements on his degree programme and for his essay on the topic of ‘Green Finance’. Luke’s essay was viewed by CISI as being in the top 5 in a UK-wide competition.